What is Chromatography and How it Does it Work? Chromatography is a technique for separating mixtures into their constituent parts. At its core, chromatography is the interaction between a mobile phase (which carries the mixture being separated) and a stationary phase (which performs the separation). At its inception, chromatography was used to separate plant pigments into their contributing chemicals. A pigment, such as chlorophyll, would be marked onto a sheet of silica, glass, or plastic and soaked in an appropriate solvent. As the solvent moved along the sheet, it dissolved the chlorophyll and smudged the original mark. This smudge would gradually separate into different color bands as it travelled with the solvent. (In this example, chlorophyll is the analyte mixture or sample, the sheet is the stationary phase, and the solvent is the mobile phase.) The different color bands present after the separation gave the technique its namesake, with “chroma” meaning “color” and “graphy” meaning “to write”. Today, most applications of chromatography are generally less colorful but the underlying principle of separation remains unchanged. It is possible to separate compounds based on degrees of specificity not possible 5 or 10 years ago. A variety of chromatography equipment is also available that can provide an accurate identification of known compounds or in-depth data about unknown compounds. This allows for the analysis of unique parts within a complex mixture, such as identifying sugars within a given food. Chromatography can be used in a myriad of applications from analyzing miniscule samples to production-scale use as a purification step. For example, chromatography can be used to quantify how much pesticide residue was present in a batch of apple juice or determine how much of an active drug is present in a pill. Regardless of how it is used, the overall effectiveness of chromatography largely depends on choosing the right technique and phases to use within that technique. Most chromatography methods have an inert mobile phase that carries the analyte through a long stationary phase housed inside a column. The stationary phase is designed to separate the components of the analyte based on some defined characteristic, which causes some molecules to migrate through the stationary phase more slowly and others to pass through more quickly. Stationary phases exist which can divide analytes along the strength of their polarity, how well they bind to certain chemicals, their ionic charge, or their size. For example, in gel permeation chromatography, special inert beads are used as the stationary phase, and the mobile phase carries the analyte past those beads. Because of how the beads are designed, larger molecules will spend less time in the column as they move through the gaps in the beads. As a result, the largest molecule will leave the column first and the smallest last. The separated analyte components pass from the column through a flow cell, where unique technology is employed to detect the presence of the components in the mobile phase stream. In most laboratories, chromatography is performed using high-performance liquid chromatography (HPLC) or gas chromatography (GC). In HPLC, liquid serves as the mobile phase, and the stationary phase is most often found inside a column (a polymer or stainless-steel tube filled with small spherical particles that have specially modified surfaces to selectively interact with molecules in different ways). [NOTE: The pressures present in most HPLC systems can be very high, due to the resistance of the flow of mobile phase through the densely packed column. Because of this, the “P” in HPLC is often mistakenly referred to as “pressure”.] Because of the wide assortment of specialized stationary phases and the vast number of reagents that can be used, there is almost an infinite number of ways a scientist can customize the setup of a HPLC system to achieve the desired analyte separation. While HPLC separations are often not as efficient as GC separations, one big advantage of using HPLC is that the sample components can be reused and analyzed further if needed. In GC, the target analyte is vaporized and introduced to a flowing stream of an inert gas, such as nitrogen, which carries the analyte through the column (most often a large coil of very small fused silica tubing). Because of the nature of GC, the separations are often fast and efficient; however, the one disadvantage to GC over HPLC is that the sample can only be used once. There is no way to reuse or analyze the sample further. Other popular techniques include low-pressure liquid chromatography (LPLC), fast protein liquid chromatography (FPLC), gel permeation chromatography (GPC), ion chromatography (IC), affinity chromatography, and numerous others. 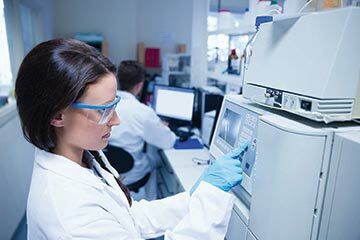 Methods such as ion exchange chromatography (IEC), affinity chromatography (AF), and fast protein liquid chromatography (FPLC) can provide more specific solutions than the workhorse options of HPLC and GC. STEP 1 – A defined amount of analyte is carefully introduced to the constantly running mobile phase stream. STEP 2 – The mobile phase carries the analyte to—and through—the stationary phase. STEP 3 – Once the analyte arrives at the stationary phase, the components that comprise the analyte selectively interact with the stationary phase, with some components interacting more and some less, resulting in the desired separation. STEP 4 – The mobile phase carries the separated analyte components to a special instrument that can detect the presence of the components in the mobile phase and provide a data signal that can be used to quantify the separation. Chromatography is a popular technique used in laboratories around the world. Scientists are employing chromatography as an analysis tool for pharmaceuticals, food and beverage, industrial, forensics, and many other industries. As the technology driving the growth and implementation of chromatography constantly improves, the basic principle remains the same with the overall effectiveness of chromatography largely depending on the scientist choosing the right technique and phases to use within that technique. With the wide assortment of chromatographic techniques available, today’s scientists have many options available to help them achieve the chemical separation they desire.